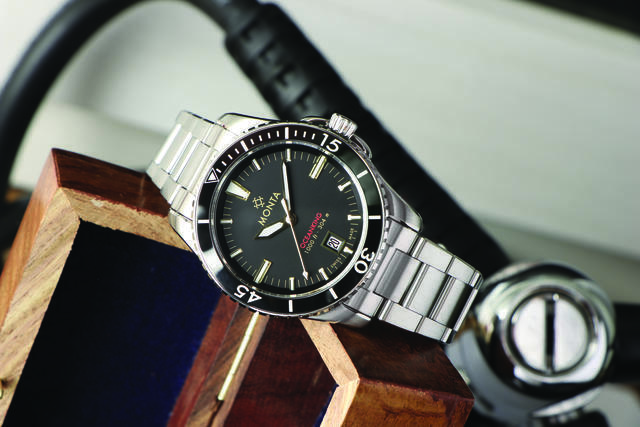 Dive watches are like screwdrivers. Everyone needs one in their tool box, and you’re bound to buy one when you see a new feature your old one doesn’t have. 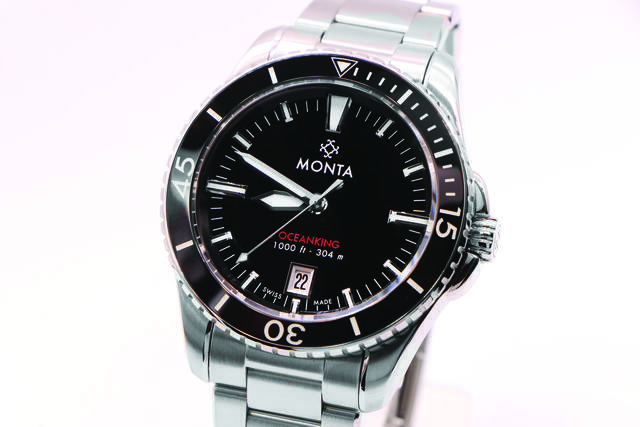 The Monta Oceanking is like that since it adds comfortable details and unique innovations to an everyday tool watch priced less than $2,000. Monta and its St. Louis-based founders first launched its diver a few years ago and then listened closely to customers. The company took that feedback and reissued the Oceanking with crown guards, a smaller case, and a different mechanical movement that is more common and easily serviced. They also reduced the price and created more dial options. The curves on the smaller, 40.7mm case called to me immediately and represent the signature characteristic of this watch. They are subtle, even soft, and make the bracelet and case comfortable to hold and wear. This overall finish along with the 11.9mm case height make it ideally suited for an everyday wear. The beveled edges work their way around the case from the 20mm lugs to the crown guards, which offer a snug set of polished shoulders that gently slope up to the polished crown. The crown is well protected between these guards, so it may take smaller hands than mine to easily grasp it. The coin-edge of the bezel has a beveled edge and is fitted superbly on the case to make the most satisfying sixty clicks around the dial using its patent-pending assembly. The luminescent ceramic insert is a nice addition to its exceptional function. It’s the details that get my attention on this diver. For example, I liked like the tight integration between the case and bracelet and the fully articulating solid, beveled links held together with screws and not pins. I can’t believe how this small feature adds comfort to the bracelet, but it does. Monta has put some of its energy into the bracelet’s patent-pending deployant clasp design that allows the subtlest size adjustment without a tool. It’s easy to figure out and can quickly make a difference when you’re sizing it for daily changes to your wrist. It’s easy to see the innovative spirit in its bezel or clasp, but a noticeable refinement came from Monta’s willingness to launch the first version and learn from it. I can’t imagine a large brand being able to release a watch, listen to customers and offer changes that included a redesigned smaller case with crown guards smaller than the original version. This customer responsiveness has to be part of the calculation when deciding to buy from a microbrand. To accommodate the smaller case size, Monta switched movements from the Eterna 3909a to Sellita’s high-grade SW300 self-winding chronometer movement, which has the respectable 42-hour reserve. All this reliability weighs only 158 grams and is sealed with a solid case back, so it can handle a depth rating of 304 meters (1,000 feet) of water resistance. The seven-layers of anti-reflective coating applied to the inside of the flat sapphire crystal make the white sword hands clear and legible. In this model, Monta uses gilt on the sweeping seconds hand and to frame the hour and minute hands. These accents provide a subtle, handsome contrast to the flat black dial. The dial’s text is proportionate to the space and balanced making it easy to navigate visually. Monta uses gilt on the sweeping seconds hand and to frame the hour and minute hands. The size and color of the text remain visually subservient to the applied hour indices of LumiNova BG W9 surrounded in the same gilt, while the date window has a subtle gold trim outlining the beveled window. You’ve heard those who dislike the date window on these divers, but I like it here. I think a black date wheel instead, like on the Monta Triumph, would meet both the visual and functional demands of the market. I live in a gold-free watch world, so these subtle design elements are often wasted on me, but brands know that the gold accent works. Although this is not my preference, I think the gold could be added to parts of the ceramic bezel, as well, to tie the accents together. Monta offers black, blue and ‘wet’ blue dials and black, blue and steel bezels. If the gilt dial isn’t your style, Monta offers black, blue and wet blue dials along with black, blue and steel bezels. The Monta website does a good job showing the options, which include rubber straps in blue and black. 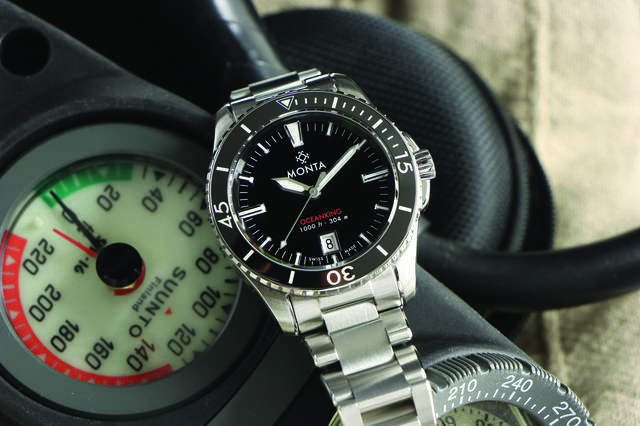 Dive watches that respect the tried and true design elements of the past can cost more or less than the Oceanking, so Monta offers innovation and the entrepreneur motivation of a U.S. company that can go head-to-head with bigger brands. The watch will retail for $1,925 on bracelet and $1,700 on rubber through the Monta Watch website. The watch comes with a two-year warranty. Ken Nichols is a writer and photographer living in the South with his wife, three girls, vintage Airstream and humble watch collection.